Coronation of Celestine V, the only pope to be crowned twice. "Pontifical coronation" redirects here. For the expressed rite of ceremoniously crowning Catholic images by the Pope, see Canonical coronation. 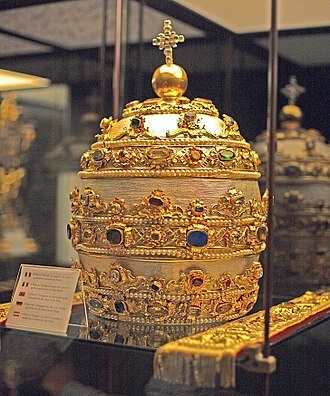 A papal coronation was the ceremony of the placing of the papal tiara on a newly elected pope. The first recorded papal coronation was that of Nicholas I in 858. The last was the 1963 coronation of Paul VI, who soon afterwards abandoned the practice of wearing the tiara. None of his successors have used the tiara, and their papal inauguration celebrations have included no coronation ceremony. The papal inauguration celebration, with or without a coronation, has only symbolic significance, as a pope assumes office immediately on giving his consent to a valid election. In Spanish, the term Coronación Pontificia (English: "pontifical coronation") is sometimes used for the canonical coronation of religious images by via a formal expressed decree by a reigning Pope. When a conclave elects a new pope, he assumes all of the rights and authority of the papacy immediately upon his acceptance of election; however, popes traditionally numbered their regnal years from the date of their coronation. If a newly elected pope is not a bishop, he is consecrated at once. In accordance with tradition, the right of consecration belongs to the Dean of the College of Cardinals, in his absence to the Subdean, and in the absence of both of these, to the senior Cardinal Bishop. If the new pope is already a bishop, as is normally the case, his election is announced immediately to the people gathered in Saint Peter's Square and he gives them his blessing. The episcopal enthronement of the pope takes place in his cathedral, the Archbasilica of St. John Lateran. This ceremony was once combined with the coronation. During the Avignon papacy, the pope, being in France, could not be enthroned in his cathedral in Rome. The coronations continued, while enthronements had to await a return to Rome. When Gregory XI did return to Rome, the Lateran Palace was badly in need of repair, so the popes made the Vatican their residence and transferred coronations to Saint Peter's Basilica. 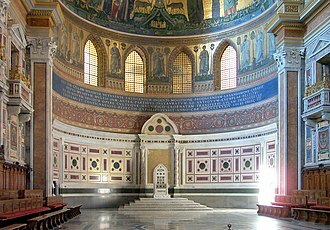 The Lateran Basilica remains the cathedral of Rome, and the enthronement occurs there. During the "prisoner in the Vatican" period, the enthronement did not take place. The coronation took place on the first Sunday or Holy Day following the election. It began with a solemn Papal Mass. During the chanting of Terce, he sat on a throne and all of the cardinals made what was called their "first obeisance" to him, approaching one by one and kissing his hand. Then the archbishops and bishops approached and kissed his feet. Following this, at least from the beginning of the 16th century, the newly elected pope was carried in state through St. Peter's Basilica on the sedia gestatoria, under a white canopy, with the papal flabella (ceremonial fans) to either side. Instead of the papal tiara, he wore a jewelled mitre (the episcopal mitra pretiosa). Three times, the procession was stopped, and a bundle of flax lashed to a gilded staff was burnt before the newly elected pontiff, while a master of ceremonies said: Pater Sancte, sic transit gloria mundi (Holy Father, thus passes the glory of the world) as a symbolic reminder to set aside materialism and vanity. Once at the high altar, he would begin to celebrate Solemn High Mass with full papal ceremonial. God, who are present without distinction whenever the devout mind invokes you, be present, we ask you, we and this your servant, __, who to the summit of the apostolic community has been chosen as the judge of your people, infuse with the highest blessings that he experience your gift who has reached this point. We supplicate you, Almighty God, effect your customary devotion and pour out on this your servant, __, the grace of the Holy Spirit that he who is constituted at the head of our church as the servant of the mystery, you would strengthen with the fullness of virtue. God, who willed your Apostle Peter to hold first place in the inner fellowship of the apostles, that universal Christianity overcome evil, look propitiously we ask on this your servant, __, who from a humble position has suddenly been enthroned with the apostles on this same principal sublimity, that just as he has been raised to this exalted dignity, so may he likewise merit to accumulate virtue; in bearing the burden of the universal church, help him, make him worthy and for thee who are blessed may merits replace vices. Accept the pallium, representing the plenitude of the Pontifical office, to the honour of Almighty God, and the most glorious Virgin Mary, his Mother, and the Blessed Apostles Peter and Paul, and the Holy Roman Church. 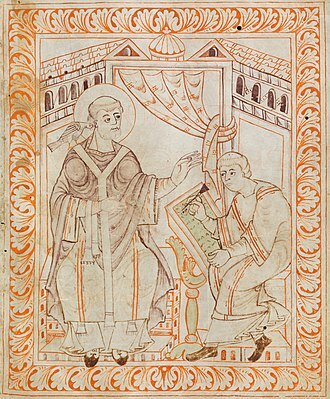 In the 11th and 12th centuries, the immantatio, or bestowal of the mantum (a papal vestment consisting of a very long red cope fastened with an elaborate morse) on the newly elected pope was regarded as especially symbolic of investiture with papal authority, and was conferred with the words: "I invest thee with the Roman papacy, that thou rule over the city and the world." Savior of the world Grant him aid. Saint Mary Grant him aid. Saint Michael Grant him aid. As with all Papal High Masses, the Epistle and the Gospel were read in both Greek and Latin and the pope communicated at his throne. Accipe tiaram tribus coronis ornatam, et scias te esse patrem principum et regum, rectorem orbis in terra vicarium Salvatoris nostri Jesu Christi, cui est honor et gloria in saecula saeculorum (Receive the tiara adorned with three crowns, and know that you are the father of princes and kings, the ruler of the world, the vicar of our Savior Jesus Christ on earth, to whom is honor and glory, world without end). Following his coronation, the pope imparted the solemn papal blessing Urbi et Orbi. The last act of the inauguration of a new pope is still the formal taking possession (possessio) of his cathedra as Bishop of Rome in the Archbasilica of St. John Lateran. This is the final ceremony mentioned in Pope John Paul II's Apostolic Constitution on the vacancy of the Apostolic See and the election of the Roman Pontiff. The pope is enthroned in the same manner as other bishops. He is solemnly conducted to the episcopal throne, and takes possession by seating himself on it. He receives the kiss of peace and listens to the reading of a passage of Holy Scripture, whereupon he pronounces an address that used to be called the sermo inthronisticus. In ancient times, the letters that the pope sent to the patriarchs in token of being in communion with them in the same faith were called litterae inthronisticae or syllabai enthronistikai. The earliest papal coronations took place in St. John Lateran, the pope's cathedral. 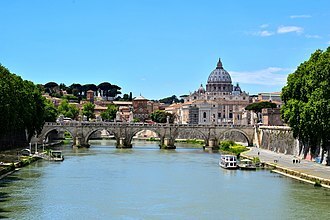 However, for hundreds of years papal coronations have traditionally taken place in the environs of St. Peter's Basilica, though a number of coronations took place in Avignon, during the Avignon papacy. Earlier, Pope Celestine V was twice crowned in L'Aquila. In 1800 Pope Pius VII was crowned in the crowded church of the Benedictine island monastery of San Giorgio, Venice, after his late predecessor, Pope Pius VI, had been forced into temporary exile during Napoleon Bonaparte's capture of Rome. Since the French seized the tiara along with the previous pope, he was crowned with a papier-mâché tiara, for which the ladies of Venice gave up their jewels. All coronations after 1800 took place in Rome. Leo XIII was crowned in the Sistine Chapel, due to fears that anti-clerical mobs, inspired by Italian unification, might attack the Basilica and disrupt the ceremony. Benedict XV was also crowned in the chapel in 1914. Pius XI was crowned at the dais in front of the High Altar in St. Peter's Basilica. Popes Pius IX, Pius XII, and John XXIII, all were crowned in public on the balcony of the basilica, facing crowds assembled below in St. Peter's Square. Paul VI was crowned in front of St Peter's on a special dais. 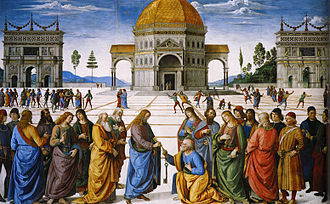 The entire coronation ceremony had taken place outdoors as St Peter's was filled with special seating for the Vatican Council sessions and so unavailable for the coronation. Pius XII's 1939 coronation broke new ground by being the first to be filmed and the first coronation to be broadcast live on radio. The ceremony, which lasted for six hours, was attended by leading dignitaries; these included the heir to the Italian throne, the Prince of Piedmont, former kings Ferdinand I of Bulgaria and Alfonso XIII of Spain, the Duke of Norfolk (representing King George VI of the United Kingdom), and the Irish Taoiseach Éamon de Valera, the last two being in evening dress (white tie and tails). The last pope to be crowned was Paul VI. Though he decided to cease wearing a papal tiara within weeks of his coronation, and laid his own on the altar of St. Peter's Basilica in a gesture of humility, his 1975 Apostolic Constitution, Romano Pontifici Eligendo, still prescribed that "the new pontiff is to be crowned by the senior cardinal deacon." Nevertheless, his successor, John Paul I, opted not to be crowned and to have a less formal "solemn Mass to mark the start of his ministry as Supreme Pastor" in September 1978. Pope John Paul I, whose memory is so vivid in our hearts, did not wish to have the tiara; nor does his Successor wish it today. This is not the time to return to a ceremony and an object considered, wrongly, to be a symbol of the temporal power of the Popes. John Paul II's 1996 Apostolic Constitution, Universi Dominici gregis, now in force, does not specify the form that the "solemn ceremony of the inauguration of the pontificate" of a new pope should take, whether with or without a coronation. 3 October 1143 Rome Pope Celestine II Gregorio Tarquini SS. Sergio e Bacco On September 26 he was consecrated bishop of Rome by Cardinal Alberic de Beauvais, bishop of Ostia. 12 March 1144 Rome Pope Lucius II Gregorio Tarquini SS. Sergio e Bacco On the same day he was consecrated bishop of Rome by Cardinal Alberic de Beauvais, bishop of Ostia. 14 March 1145 Abbey of Farfa Pope Eugenius III Odone Bonecase S. Giorgio in Velabro On February 18 he was consecrated bishop of Rome by Cardinal Corrado della Suburra, bishop of Sabina and dean of the Sacred College of Cardinals. 20 September 1159 Nympha Pope Alexander III Odone Bonecase S. Giorgio in Velabro On that same day, he was consecrated bishop of Rome by Cardinal Ubaldo Allucingoli, bishop of Ostia e Velletri. 22 July 1167 Rome Antipope Paschal III On April 22, 1164 he was consecrated bishop of Rome at Lucca by Henry II of Leez prince-bishop of Liège (not a cardinal). 6 September 1181 Velletri Pope Lucius III Teodino de Arrone, bishop of Porto e Santa Rufina. 25 October 1187 Ferrara Pope Gregory VIII Giacinto Bobone Orsini S. Maria in Cosmedin On that same day he was consecrated bishop of Rome, probably by Cardinal Thibaud, bishop of Ostia e Velletri (?). August 31, 1216 Rome Pope Honorius III Guido Pierleone S. Nicola in Carcere Tulliano On July 24, he was consecrated bishop of Rome by Cardinal Ugolino Conti di Segni, bishop of Ostia e Velletri. 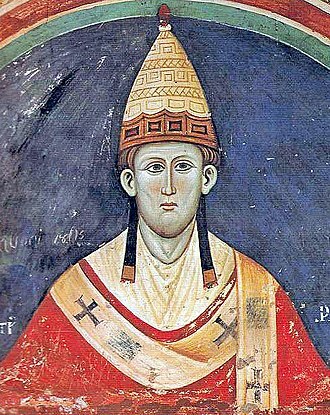 June 28, 1243 Anagni Pope Innocent IV Rainiero Capocci S. Maria in Cosmedin On that same day, he was consectrated bishop of Rome, probably by Cardinal Rinaldo Conti di Segni, bishop of Ostia e Velletri and dean of the Sacred College of Cardinals (?). March 23, 1272 Rome Pope Gregory X Giovanni Gaetano Orsini Deacon of S. Nicola in Carcere Tulliano On March 19 he was consecrated bishop of Rome by (?) (possibly by Cardinal Odo of Châteauroux, bishop of Frascati and dean of the Sacred College of Cardinals). December 26, 1277 Rome Pope Nicholas III Giacomo Savelli S. Maria in Cosmedin On December 19 he was consecrated bishop of Rome by (?) (possibly by Cardinal Bertrand de Saint-Martin, bishop of Sabina and dean of the Sacred College of Cardinals). March 23, 1281 Orvieto Pope Martin IV Giacomo Savelli S. Maria in Cosmedin On that same day he was consecrated bishop of Rome by Cardinal Latino Malabranca Orsini, bishop of Ostia e Velletri. May 19, 1285 Rome Pope Honorius IV Goffredo da Alatri S. Giorgio in Velabro On that same day he was consecrated bishop of Rome by Cardinal Latino Malabranca Orsini, bishop of Ostia e Velletri. August 29, 1294 Aquila Pope Celestine V Probably by Cardinal Matteo Orsini Rosso S. Maria in Portico On that same day he was consecrated bishop of Rome probably by Cardinal Hugh Aycelin, bishop of Ostia e Velletri. He was crowned again a few days later (the only instance of a double papal coronation). January 23, 1295 Rome Pope Boniface VIII Matteo Orsini Rosso S. Maria in Portico On that same day he was consecrated bishop of Rome by Cardinal Hugh Aycelin, bishop of Ostia e Velletri. May 15, 1328 Rome Antipope Nicholas V Giacomo Alberti pseudocardinal-bishop of Ostia e Velletri On May 12 he was consecrated bishop of Rome also by Giacomo Alberti, at that time bishop of Castello. November 6, 1362 Avignon Pope Urban V Probably by Cardinal Guillaume de la Jugié S. Maria in Cosmedin On that same day he was consecrated bishop of Rome by Cardinal Andouin Aubert, bishop of Ostia e Velletri. January 3, 1371 Avignon Pope Gregory XI Cardinal Rinaldo Orsini S. Adriano On that same day, he was consecrated bishop of Rome by Cardinal Guy de Boulogne, bishop of Porto e Santa Rufina and dean of the Sacred College of Cardinals. November 9, 1389 Rome Pope Boniface IX Tommaso Orsini S. Maria in Domnica On that same day he was consecrated bishop of Rome by Cardinal Francesco Moricotti Prignano, bishop of Palestrina and dean of the Sacred College of Cardinals. October 11, 1394 Avignon Antipope Benedict XIII Hugues de Saint-Martial S. Maria in Portico On that same day, he was consecrated bishop of Rome by Cardinal Jean de Neufchâtel, bishop of Ostia e Velletri. May 25, 1410 Bologna Antipope John XXIII Rinaldo Brancaccio SS. Vito e Modesto On that same day, he was consecrated bishop of Rome by Cardinal Jean Allarmet de Brogny, bishop of Ostia e Velletri and sub-dean of the Sacred College of Cardinals. November 21, 1417 Constance Pope Martin V Amedeo Saluzzo S. Maria Nuova On November 14 he was consecrated bishop of Rome by Cardinal Jean Allarmet de Brogny, bishop of Ostia e Velletri and dean of the Sacred College of Cardinals. August 25, 1471 Rome Pope Sixtus IV Rodrigo Borgia S. Nicola in Carcere Tulliano On that same day, he was consecrated bishop of Rome by Cardinal Guillaume d'Estouteville, bishop of Ostia e Velletri and sub-dean of the Sacred College of Cardinals. October 8, 1503 Rome Pope Pius III Raffaele Riario S. Giorgio in Velabro On October 1 he was consecrated bishop of Rome by Cardinal Giuliano della Rovere, bishop of Ostia e Velletri and sub-dean of the Sacred College of Cardinals. March 19, 1513 Rome Pope Leo X Alessandro Farnese S. Eustachio On March 17 he was consecrated bishop of Rome by Cardinal Raffaele Riario, bishop of Ostia e Velletri and dean of the Sacred College of Cardinals. April 10, 1555 Rome Pope Marcellus II Jean du Bellay, bishop of Porto e Santa Rufina On that same day he was consecrated bishop of Rome by Cardinal Gian Pietro Carafa, bishop of Ostia e Velletri and dean of the Sacred College of Cardinals. February 9, 1592 Rome Pope Clement VIII Francesco Sforza di Santa Fiora S. Maria in Via Lata On February 2 he was consecrated bishop of Rome by Cardinal Alfonso Gesualdo, bishop of Ostia e Velletri and dean of the Sacred College of Cardinals. December 8, 1700 Rome Pope Clement XI Benedetto Pamphilj S. Maria in Via Lata On November 30 he was consecrated bishop of Rome by Cardinal de Bouillon, bishop of Porto e Santa Rufina and dean of the Sacred College of Cardinals. June 4, 1769 Rome Pope Clement XIV Alessandro Albani S. Maria in Via Lata On May 28 he was consecrated bishop of Rome by Cardinal Federico Marcello Lante, bishop of Porto e Santa Rufina and sub-dean of the Sacred College of Cardinals. February 22, 1775 Rome Pope Pius VI Alessandro Albani S. Maria in Via Lata On that same day, he was consecrated bishop of Rome by Cardinal Giovanni Francesco Albani, bishop of Porto e Santa Rufina and dean of the Sacred College of Cardinals. February 6, 1831 Rome Pope Gregory XVI Giuseppe Albani S. Maria in Via Lata On that same day he was consecrated bishop of Rome by Cardinal Bartolomeo Pacca, bishop of Ostia e Velletri and dean of the Sacred College of Cardinals. ^ a b c "Catholic Encyclopedia, "Pope Celestine V, Saint"". Archived from the original on 2012-03-09. Retrieved 2011-05-19. ^ Kazimierz Dopierała, Księga Papieży, Poznań 1996, p. 104. ^ "Deus qui adesse non delignaris ubicumque devota mente invocaris, adesto quaesumus invocationibus nostris et huic famulo tuo N. quem ad culmen apostolicum commune iudicium tuae plebis elegit ubertatem supernae benedictionis infunde, ut sentiat se tuo munere ad hunc apicem pervenisse." Coronation Rites, Reginald Maxwell Woolley, B.D. (Cambridge: at the University Press, 1915), pp. 160-161. ^ "Supplicationibus, omnipotens Deus, effectum consuetae pietatis impende, et gratia Spiritus Sancti hunc famulum tuum N. perfunde; ut qui in capite ecclesiarum nostrae servitutis mysterio constituitur, tuae virtutis soliditate roboretur." Ibid., p. 161. ^ "Deus qui Apostolum tuum Petrum inter caeteros coapostolos primatum tenere voluisti, eique universae Christianitatis molem superimpostuisti; respice propitius quaesumus hunc famulum tuum N. quem de humili cathedra violenter sublimatum in thronum eiusdem apostolorum principis sublimamus: ut sicut profectibus tantae dignitatis augetur, ita virtutum meritis cumuletur; quatenus ecclesiasticae universitatis onus, te adiuvante, digne ferat, et a te qui es beatitudo tuorum meritam vicem recipiat." Ibid. ^ This prayer is from the form for the Consecration of a bishop. Woolley. p. 163. ^ Woolley, p. 163. The Papal Laudes were most recently chanted during the opening procession of the inauguration Mass of Pope Benedict XVI on April 24, 2005. ^ I.e., the Sacrament was brought to the Pope by the deacon and the subdeacon at his throne and he consumed a portion of the Host and drank from the Chalice by means of a narrow gold or silver-gilt tube called a fistula. ^ According to the Encyclopaedia Americana, article "Tiara", the words were "... scias te esse patrem, principem et regem ... (know that you are a father, a prince and a king). ^ John Cornwell, Hitler's Pope: The Secret History of Pius XII (Viking, 1999) pp. 211-212. ^ Romano Pontifici Eligendo Section 92. ^ "National Catholic Register: 33 Days of the Smiling Pope". Archived from the original on 2009-01-09. Retrieved 2008-12-25. ^ S. Miranda: Cardinal Uberto Crivelli (Pope Urban III) says that Urban III was crowned by protodeacon Giacinto Bobone Orsini but this is unlikely because this cardinal was absent from the papal court at that time (see papal election, 1185). Cardinal Rivoltella was the most senior cardinal-deacon present. ^ "The Coronation of Pope Leo XIII". Catholic World. 27 (158): 280–285. Retrieved 28 September 2018. Wikimedia Commons has media related to Category:Papal coronation. Consecration is the solemn dedication to a special purpose or service, usually religious. The word consecration literally means association with the sacred, places, or things can be consecrated, and the term is used in various ways by different groups. A synonym for to consecrate is to sanctify, a distinct antonym is to desecrate, consecration is used in the Catholic Church as the setting apart for the service of God of both persons and objects. The ordination of a new bishop is called a consecration. While the term episcopal ordination is now common, consecration was the preferred term from the Middle Ages through the period including the Second Vatican Council. The Vatican II document Constitution on the Sacred Liturgy n.76 states, Both the ceremonies, the address given by the bishop at the beginning of each ordination or consecration may be in the mother tongue. When a bishop is consecrated, the laying of hands may be done by all the bishops present, the life of those who enter religious institutes and similar institutes is described as Consecrated life. The rite of consecration of virgins can be traced back at least to the fourth century, by the time of the Second Vatican Council, the bestowal of the consecration was limited to cloistered nuns only. The Council directed that this should be revised, two similar versions were prepared, one for women living in monastic orders, another for consecrated virgins living in the world. An English translation of the rite for those living in the world is available on the web site of the United States Association of Consecrated Virgins, Chrism, an anointing oil, is olive oil consecrated by a bishop. Objects such as patens and chalices, used for the Sacrament of the Eucharist, used to be consecrated by a bishop, using chrism. Before a new priest is ordained, the day there is a vigil. 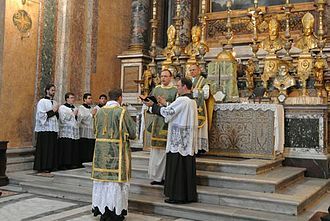 A more solemn rite exists for what used to be called the consecration of an altar, the rite is now called the dedication. Since it would be contradictory to dedicate to the service of God a mortgage-burdened building, to consecrate the bread and wine, the priest speaks the Words of Institution. 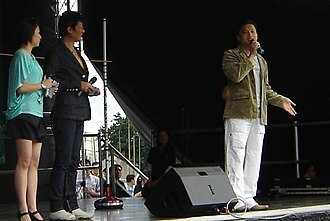 A master of ceremonies, abbreviated M. C. called compère and announcer, is the official host of a ceremony, a staged event or similar performance. The master of ceremonies sometimes refers to the officer during an official state function. Today, the term often connotes a master of ceremonies who presents performers, speaks to the audience, entertains people, in addition, the term exists in various chivalric orders and fraternal orders. The term originated in the Catholic Church, the Master of Ceremonies is an official of the Papal Court responsible for the proper and smooth conduct of the elegant and elaborate rituals involving the Pope and the sacred liturgy. He may be an involved in the proper conduct of protocols and ceremonials involving the Roman Pontiff, the Papal Court. Examples of official liturgical books prescribing the rules and regulations of liturgical celebrations are Cæremoniale Romanum, the office of the Master of Ceremonies itself is very old. 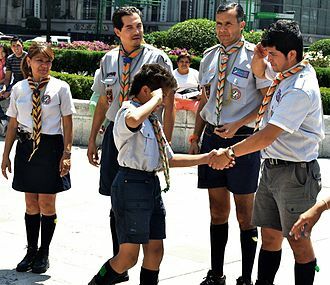 According to the Catholic Encyclopedia, the most ancient ceremonials and rituals of the Catholic Church are the Ordines Romani, names of Masters of Ceremonies are known since the late Middle Ages and the Renaissance. However, copies of books prescribing the forms of rituals, rites and it is reasonable to assume that the ceremonials themselves pre-date Gelasius. However, documentary evidence from the late Roman period is scarce or lost, the ceremonies and practices of the Byzantine emperors are known to have influenced the papal court. 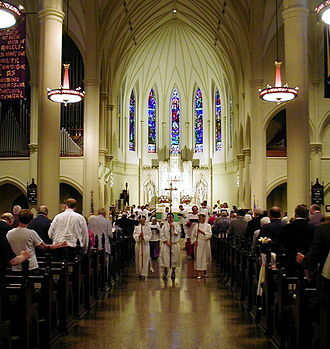 At a large Catholic church or cathedral, the Master of Ceremonies organizes and rehearses the proceedings and he may have responsibility for the physical security of the place of worship during the liturgy. At major festivities such as Christmas and Easter, when the liturgies are long and complex, the current papal Master of Ceremonies is Monsignor Guido Marini, who succeeded Archbishop Piero Marini. Masters of Ceremonies at weddings and private events ensure the coordination of their event, became an alternative title for a rapper and for their role within hip hop music and culture. The term is used as a term of distinction, referring to an artist with good performance skills. Pope Benedict XV, born Giacomo Paolo Giovanni Battista della Chiesa, was Pope from 3 September 1914 until his death in 1922. His pontificate was overshadowed by World War I and its political, social. Between 1846 and 1903, the Catholic Church had experienced two of its longest pontificates in history up to that point, together Pius IX and Leo XIII ruled for a total of 57 years. ”The war and its consequences were the main focus of Benedict XV. He immediately declared the neutrality of the Holy See and attempted from that perspective to mediate peace in 1916 and 1917, German Protestants rejected any “Papal Peace” as insulting. The French politician Georges Clemenceau regarded the Vatican initiative as being anti-French, after the war, he repaired the difficult relations with France, which re-established relations with the Vatican in 1921. During his pontificate, relations with Italy improved as well, as Benedict XV now permitted Catholic politicians led by Don Luigi Sturzo to participate in national Italian politics, the new Code of Canon Law is considered to have stimulated religious life and activities throughout the Church. He named Pietro Gasparri to be his Cardinal Secretary of State, World War I caused great damage to Catholic missions throughout the world. Benedict XV revitalized these activities, asking in Maximum Illud for Catholics throughout the world to participate, for that, he has been referred to as the Pope of Missions. His last concern was the persecution of the Catholic Church in Soviet Russia. Benedict XV was devoted to the Blessed Virgin Mary and authorized the Feast of Mary, after seven years in office, Pope Benedict XV died on 22 January 1922 after battling pneumonia since the start of that month. He was buried in the grottos of Saint Peters Basilica, with his diplomatic skills and his openness towards modern society, he gained respect for himself and the papacy. Giacomo della Chiesa was born at Pegli, a suburb of Genoa, third son of Marchese Giuseppe della Chiesa and his wife Marchesa Giovanna Migliorati. Genealogy findings report that his fathers side produced Pope Callixtus II and claimed descent from Berengar II of Italy and he is a descendant of Blessed Antonio della Chiesa. Sic transit gloria mundi is a Latin phrase that means Thus passes the glory of the world. It has been interpreted as Worldly things are fleeting, the phrase was used in the ritual of papal coronation ceremonies between 1409 and 1963. As the newly chosen pope proceeded from the sacristy of St. Peters Basilica in his sedia gestatoria, on each occasion a papal master of ceremonies would fall to his knees before the pope, holding a silver or brass reed, bearing a tow of smoldering flax. For three times in succession, as the cloth burned away, he would say in a loud and mournful voice, Pater Sancte and these words, thus addressed to the pope, served as a reminder of the transitory nature of life and earthly honors. The stafflike instrument used in the ceremony is known as a sic transit gloria mundi. A form of the phrase appeared in Thomas à Kempiss 1418 work The Imitation of Christ, the phrase continues to be used in analyses of history and politics, such as those considering the end of the American Century. A slightly truncated version, sic transit gloria, appears in the Wes Anderson movie Rushmore, the phrase illustrates a central theme of the film. This phrase was used by the American rock band Brand New for the title of a song on their album Deja Entendu. Glory Fades, about the loss of sexual innocence, in the movie Foul Play, starring Chevy Chase and Goldie Hawn, Hawns character is named Gloria Mundy. A New York Daily News story about the 1980 state transit bailout was published under the headline Sick Transits Glorious Monday, the Australian singer Nick Cave uses a colloquial version of the phrase in the title of his song There She Goes My Beautiful World from the album Abbatoir Blues. In Carry on Cleo, during a sea journey to Egypt and he replies Just a little sick transit Gloria, Gloria being the slave girls name. In A Canticle for Leibowitz, a monk utters the variant Sic transit mundus as a scene of destruction begins. The closing monologue in Patton concludes with the line A slave stood behind the conqueror, holding a crown, and whispering in his ear a warning. The Lateran Palace, formally the Apostolic Palace of the Lateran, is an ancient palace of the Roman Empire and the main papal residence in southeast Rome. Located on St. Johns Square in Lateran on the Caelian Hill, the edifice is adjacent to the Archbasilica of St. John Lateran, the cathedral church of Rome. From the fourth century, the palace was the residence of the popes. The palace is now used by the Vatican Historical Museum, which illustrates the history of the Papal States. 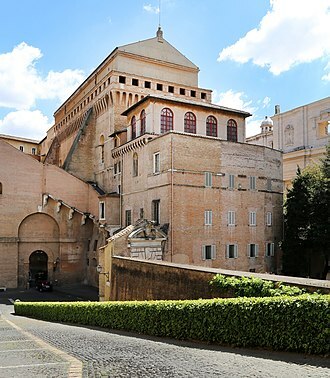 The palace houses the offices of the Vicariate of Rome, as well as the apartments of the Cardinal vicar. 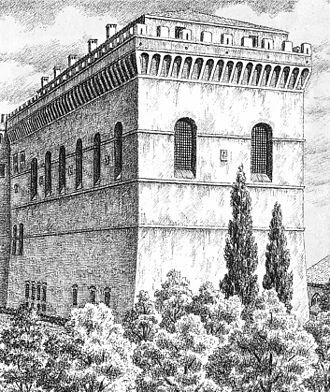 Until 1970, the palace was home to the important collections of the Lateran Museum. Following the Lateran Treaty of 1929, the palace and adjoining basilica are extraterritorial properties of the Holy See, the site on which the Basilica di San Giovanni in Laterano sits was occupied during the early Roman Empire by the domus of the Plautii Laterani family. The Laterani served as administrators for several emperors, their ancestor Lucius Sextius Lateranus is said to have been the first plebeian to attain the rank of consul, one of the Laterani, Consul-designate Plautius Lateranus, became famous for being accused by Nero of conspiracy against the emperor. 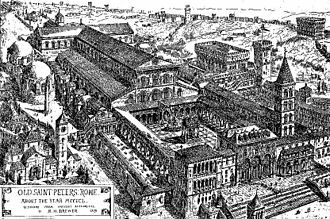 The accusation resulted in the confiscation and redistribution of his properties, the Domus Laterani fell into the hands of the emperor when Constantine I married his second wife Fausta, sister of Maxentius. Known by that time as the Domus Faustae or House of Fausta, the equites singulares had allegedly supported Maxentius against Constantine. He commissioned the construction of the Basilica di San Giovanni in Laterano the site, the domus was eventually given to the Bishop of Rome by Constantine. As Byzantium grew less able to help prevent Lombard incursions, the became more independent of the Empire. 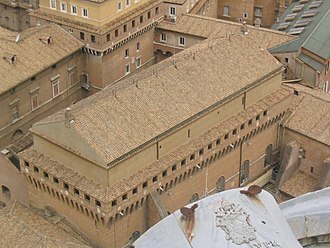 Author Erik Thunø notes that the incentive to refurbish the Lateran Palace was to create a residence from which the pope could exercise not only spiritual. 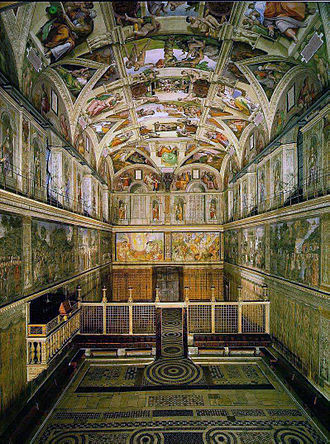 The pope’s palace at the Lateran in Rome was extensively added to in the eighth century by Pope Hadrian I. Leo III, built an enormous Triclinium and it was one of the most famous halls of the ancient palace and was the state banqueting hall, lined with mosaics. 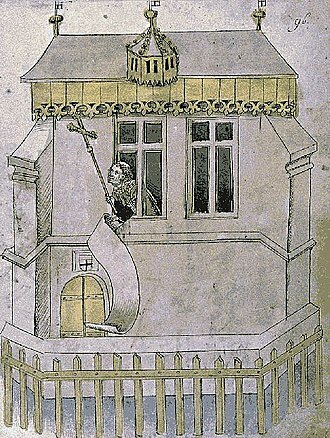 In that context, it has remained connected to the Papacy. It is decorated with six crosses, one on each tail and four on the loop, is doubled on the left shoulder. The two latter characteristics seem to survive from the time when the Roman pallium was a simple scarf doubled and pinned on the left shoulder, in origin, the pallium and the omophor are the same vestment. 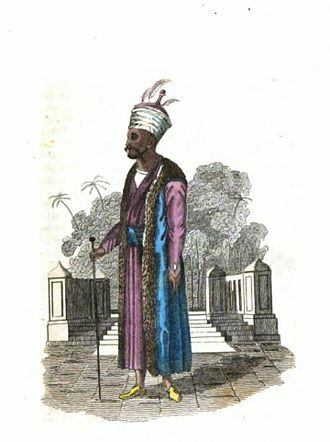 The omophor is a band of cloth, much larger than the modern pallium, worn by all Eastern Orthodox. A theory connects its origin with the figure of the Good Shepherd carrying the lamb on his shoulders, so common in early Christian art, the ceremonial connected with the preparation of the pallium and its bestowal upon the pope at his coronation, suggests some such symbolism. The lambs whose wool is destined for the making of the pallia are solemnly presented at the altar by the nuns of the convent of Saint Agnes, the Benedictine nuns of Santa Cecilia in Trastevere weave the lambs wool into pallia. At present, only the pope, metropolitan archbishops, and the Latin Rite Patriarch of Jerusalem wear the pallium, no other bishops, even non-metropolitan archbishops or retired metropolitans, are allowed to wear the pallium unless they have special permission. When a pope or metropolitan dies, he is buried wearing the last pallium he was granted, and it is unknown exactly when the pallium was first introduced. Cæsarius of Arles in 513, and in other references of the sixth century. It seems that earlier, the pope alone had the right of wearing the pallium. We hear of the pallium being conferred on others, as a mark of distinction, the honour was usually conferred on metropolitans, especially those nominated vicars by the pope, but it was sometimes conferred on simple bishops. The oath of allegiance which the recipient of the pallium takes today apparently originated in the century, during the reign of Paschal II. It is certain that a tribute was paid for the reception of the pallium as early as the sixth century and this was abrogated by Pope Gregory I in the Roman Synod of 595, but was reintroduced as partial maintenance of the Holy See. 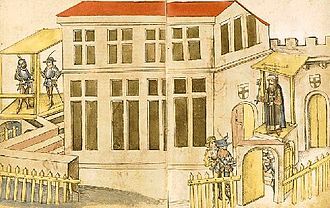 This process was condemned by the Council of Basel in 1432, the fee was abandoned amid charges of simony. There are many different opinions concerning the origin of the pallium, some trace it to an investiture by Constantine I, others consider it an imitation of the Hebrew ephod, the humeral garment of the High Priest. St. Peters Square is a large plaza located directly in front of St. Peters Basilica in the Vatican City, the papal enclave inside Rome, directly west of the neighbourhood or rione of Borgo. Both the square and the basilica are named after Saint Peter, an apostle of Jesus, at the centre of the square is an ancient Egyptian obelisk, erected at the current site in 1586. Gian Lorenzo Bernini designed the square almost 100 years later, including the massive Tuscan colonnades, four columns deep, a granite fountain constructed by Bernini in 1675 matches another fountain designed by Carlo Maderno in 1613. Bernini had been working on the interior of St, there were many constraints from existing structures. The massed accretions of the Vatican Palace crowded the space to the right of the basilicas façade, the colossal Tuscan colonnades, four columns deep, frame the trapezoidal entrance to the basilica and the massive elliptical area which precedes it. The ovato tondos long axis, parallel to the basilicas façade, the elliptical center of the piazza, which contrasts with the trapezoidal entrance, encloses the visitor with the maternal arms of Mother Church in Berninis expression. On the south side, the colonnades define and formalize the space, on the north side, the colonnade masks an assortment of Vatican structures, the upper stories of the Vatican Palace rise above. The obelisk was erected at Heliopolis, Egypt, by an unknown pharaoh. The Emperor Augustus had the moved to the Julian Forum of Alexandria, where it stood until 37 AD, when Caligula ordered the forum demolished. He had it placed on the spina which ran along the center of the Circus of Nero, the Vatican Obelisk is the only obelisk in Rome that has not toppled since ancient Roman times. During the Middle Ages, the ball on top of the obelisk was believed to contain the ashes of Julius Caesar. Fontana removed the ancient metal ball, now in a Rome museum, Christopher Hibbert writes that the ball was found to be solid. Though Bernini had no influence in the erection of the obelisk, he did use it as the centerpiece of his magnificent piazza, the paving is varied by radiating lines in travertine, to relieve what might otherwise be a sea of cobblestones. A throne is the seat of state of a potentate or dignitary, especially the seat occupied by a sovereign on state occasions, or the seat occupied by a pope or bishop on ceremonial occasions. Throne in an abstract sense can refer to the monarchy or the Crown itself, an instance of metonymy. These have ranged from stools in places such as a Africa to ornate chairs and bench-like designs in Europe and Asia, respectively. Accordingly, many thrones are typically held to have been constructed or fabricated out of rare or hard to find materials that may be valuable or important to the land in question, when used in a religious sense, throne can refer to one of two distinct uses. The other use for throne refers to a belief among many of the worlds monotheistic and polytheistic religions that the deity or deities that they worship are seated on a throne. Such beliefs go back to ancient times, and can be seen in surviving artwork, Thrones were found throughout the canon of ancient furniture. The depiction of monarchs and deities as seated on chairs is a topos in the iconography of the Ancient Near East. The word throne itself is from Greek θρόνος, chair, early Greek Διὸς θρόνους was a term for the support of the heavens, i. e. the axis mundi, which term when Zeus became an anthropomorphic god was imagined as the seat of Zeus. In Ancient Greek, a thronos was a specific but ordinary type of chair with a footstool, the Achaeans were known to place additional, empty thrones in the royal palaces and temples so that the gods could be seated when they wished to be. The most famous of these thrones was the throne of Apollo in Amyclae, the Romans had two types of thrones- one for the Emperor and one for the goddess Roma whose statues were seated upon thrones, which became centers of worship. The word throne in English translations of the Bible renders Hebrew כסא kissē, the Pharaoh of the Exodus is described as sitting on a throne, but mostly the term refers to the throne of the kingdom of Israel, often called the throne of David or throne of Solomon. The literal throne of Solomon is described in 1 Kings 10, 18-20, Moreover the king made a great throne of ivory, and overlaid it with the best gold. Papal Inauguration is a liturgical service of the Catholic Church within Mass celebrated in the Roman Rite but with elements of Byzantine Rite for the ecclesiastical investiture of a pope. Since the inauguration of Pope John Paul I, it has not included the 820-year-old papal coronation ceremony and it was in the 11th century that the papal inauguration took the form of a coronation. Along with other ceremonies used at papal inaugurations, a coronation became part of a popes inauguration ritual from the time of Pope Nicholas II until 1963. Pope Paul VI, the last pope to be crowned or to use a papal tiara, more than twenty tiaras are held in the Vatican. That of Paul VI is in the crypt of the Basilica of the National Shrine of the Immaculate Conception in Washington, a small one is still used to symbolically crown a statue of Saint Peter on his saints day every year. The first pope for eight centuries to inaugurate his pontificate without a coronation was Pope John Paul I. C. Though Paul VI decided not to wear a tiara, his 1975 Apostolic Constitution Romano Pontifici Eligendo continued to envisage a coronation ceremony for his successors. Taking place in the context of a Mass of Inauguration, the point of the ceremony was the placing of the pallium on the new popes shoulders. His successor, Pope John Paul II, followed suit, maintaining the changes made by his predecessor, the Mass of inauguration was celebrated, not in the evening, as for John Paul I, but in the morning. Four modern popes have now used an inauguration ceremony without coronation, Pope John Paul I, Pope John Paul II, Pope Benedict XVI and Pope Francis. 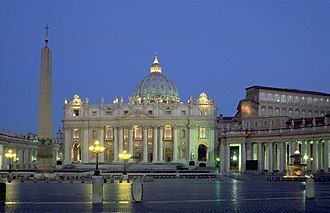 The ceremony does not include the alleged Papal Oath that some traditionalist Catholics claim, without evidence and they criticise its absence, and some sedevacantist groups refuse to accept the legitimacy of the modern popes due to the absence of both the alleged oath and the symbolic tiara. Pope Benedict said, I leave from where the Apostle arrived, the Pope and the cardinals went in procession to Saint Peters Square for the inauguration Mass, while the Laudes Regiae was chanted, asking help for the new Pope. The Pope received the pallium and the Ring of the Fisherman, Cardinal Jorge Medina, the cardinal protodeacon, formally bestowed the pallium on the Pope.4 metres long, made of wool with black silk tips. It had five embroidered red silk crosses instead of the six black ones of the normal archbishops pallium, Pope Benedict in his pontificate would use a pallium similar to that of his immediate predecessors, but with a longer, wider cut and six red crosses. After the pallium was bestowed and before the Ring of the Fisherman was presented, Cardinal Stephen Kim Sou-hwan, as the senior cardinal-priest, Cardinal Angelo Sodano, as the senior cardinal-bishop, formally presented the Ring of the Fisherman to the Pope. After Mass, Pope Benedict greeted inside St. Peters Basilica, before the main altar, in the days following, he visited the other major basilicas of Rome. 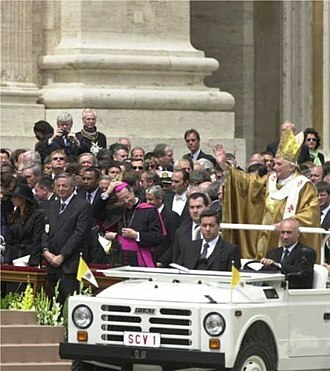 On 25 April 2005, the day after his inauguration at St. Peters, on 7 May, he took possession of the Archbasilica of St. John Lateran —his cathedral church. 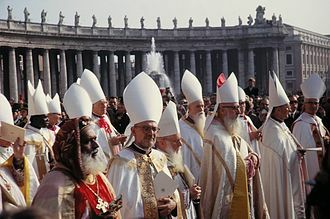 The mitre or miter, is a type of headgear now known as the traditional, ceremonial head-dress of bishops and certain abbots in traditional Christianity. The Metropolitan of the Malankara Mar Thoma Syrian Church wears a mitre during important ceremonies such as the Episcopal Consecration, the former two meanings have been etymologically connected with the word μίτος, mítos, but the connection is tenuous at best. The camelaucum, the headdress, that both the mitre and the Papal tiara stem from, was originally a cap used by officials of the Imperial Byzantine court, the tiara probably developed from the Phrygian cap, or frigium, a conical cap worn in the Graeco-Roman world. In the 10th century the tiara was pictured on papal coins, other sources claim the tiara developed the other way around, from the mitre. In the late Empire it developed into the type of Imperial crown used by Byzantine Emperors. Worn by a bishop, the mitre is depicted for the first time in two miniatures of the beginning of the eleventh century, the first written mention of it is found in a Bull of Pope Leo IX in the year 1049. By 1150 the use had spread to throughout the West. In its modern form in Western Christianity, the mitre is a tall folding cap, two short lappets always hang down from the back. In the Catholic Church, the right to wear the mitre is confined by Canon law to bishops and to abbots, as it appears in the ceremony of consecration of a bishop and blessing of an abbot. Cardinals are now supposed to be bishops, but even cardinals who are not bishops. Other prelates have been granted the use of the mitre by special privilege, former distinctions between mitred abbots and non-mitred abbots have been abolished. Three types of mitres are worn by Roman Catholic clergy for different occasions, The simplex is made of undecorated white linen or silk and it is worn most notably at funerals, Lenten time, on Good Friday and by concelebrant bishops at a Mass. Cardinals in the presence of the Pope wear a mitre of white linen damask, the pretiosa is decorated with precious stones and gold and worn on the principal Mass on the most solemn Sundays and feast days. Orthodox mitres are richly decorated in Christian iconography, often displaying intricate crosses and images of Christ and Mary. Mitre simplex traditional style: White damask with its white lappets ending in red fringes. Benedict XVI wearing a pretiosa: elaborately embroidered mitre. A chess bishop in the standard Staunton pattern. Note the difference. Pope Benedict XIII travelling on horseback. Statue of Pope Benedict XIII in Palermo. Monsignor Guido Marini (left), the Master of Ceremonies for Pontifical Liturgy, assisting at a Papal Mass with Pope Benedict XVI. Pope Benedict XVI placing a Fleur-de-Lys styled crown on a statue of Our Lady of Lourdes, although this novelty event was not a rite of canonical coronation. During a Plenary indulgence for the World Day of the Sick, 11 February 2007. The Papal bull of Pope John Paul II of 1984 that canonically granted the image of Our Lady of Hope of Triana the Pontifical (Papal) right to wear a crown. The heraldic Belgian crown, symbolically resting on the constitution in a statue of Leopold I.
Pope Pius XII is carried through St. Peter's Basilica on a sedia gestatoria. Angelo Sodano, the current Dean of the College of Cardinals.